Council of Nine (California, USA) debuts with a carefully crafted and masterfully produced album that carries the listener to a place of ancient history, through death into the void beyond. Previously known for his celebrated work on the Tomb of Empires split album, he shows here what he can do when given free range to encapsulate the listener on a full album. The bowed reverberation echoes across time and space while the holy sub frequencies of the universe are used to great effect to create a textural backdrop to isolation. Council of Nine created one of my favourite dark ambient tracks of recent times: Chimes of the Unfortunate on the Tomb Of Empires album (you can read my review here). Seeing a whole album come from him in the guise of Dakhma made me hope that I would find some more tracks to pin my praise to. While none seem to match the lighter tone of Chimes of the Unfortunate, what he has produced in Dakhma is a darker, more insidious album, one that shakes the listeners sensibilities in its own gently rumbling way. My descriptions of the tracks below incorporate a continuous narrative that suggested itself to me as I listened, taking into account the track titles and the images created by the music in my mind. The Magi – A very quiet start gently guides the listener into an expansive drone punctuated with smaller and more delicate sounds and reverberations. The title and soundscape conjured images of an abandoned temple, shadows the only thing to lace its walls. In the centre, an elderly robed figure is knelt, liver-spotted hands weaving traceries of light in the air, the dust motes floating down from the ceiling the only other movement as the atmosphere thickens. Tower of Silence – A sound that conjures the nature of wind swells with a harsher fluctuating tone that fizzes and undulates with speed variations and movement. Some of it sounds like thunder slowed and sped up. Haunting piano competes with the atmosphere. The figure from before has completed their occult working and now the structure around them trembles in contemplation. Sacrifice – A shuffling marching sound seeps into the ear, a drone growing in strength with hints of higher tones and reverberation nestling quietly at its back. Then everything grows with an echoing melody flirting with a larger drone, like pent up forces about to be unleashed. The distortions and higher pitched tones create an oppressive soundscape that rumbles and looms, consistent yet fluid at the same time. The figure collapses in a heap, a trickle of blood slinking from the edge of their open mouth and slowly pooling on the dusty stone floor beneath their cheek. All becomes quieter before loud disturbances erupt near the end of the track. Something is coming. Nasu – Piano and a dopplering beat are soon met by a rumbling drone, hints of whisper and threat permeating the space in-between. Its like the ‘shhh’ equivalent of ‘psst’, for want of a better description. Whistling joins just after the midpoint, an eerie sound that mingles uncomfortably with the soundscape. The robed figure is voiding, their juices and essence giving the stone floor the first shine it was had for many an age. 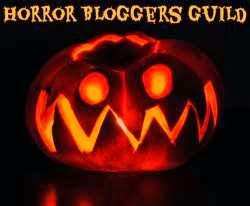 The Ossuary – This track enjoys a more electronic sound, the piano from the last track joining with a tinkling sparking sound that shrouds itself in a soft drone. The stained grey stone flakes from the walls around the figure, the glowing ethereal façade of crystal shining through from beneath. The whole temple shudders and jerks itself free of its previous form, the sole remains of the figure consisting of a skull and bones. This track has a sadness to it, like the tang of a life wasted. Circle of the Sun – A looming dripping track that echoes with pent up whispers and shifting forces. 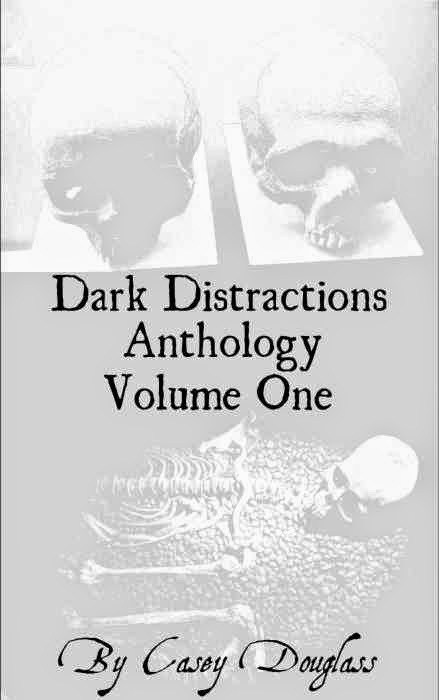 As the volume grows, everything around the skull and bones becomes hazy, darkness seeping through and blurring the outlines, tiny sparks of gold dancing along the edges that are still visible. The air rumbles with a steady drone, an electro-string note arcing like the call of some strange beast. Chanting follows, the vocals fading into the droning abyss that is slowly claiming everything. Dakhma is certainly a dark album, the soundscapes it creates all seem to drip with unseen forces and hints of sadness. The instances where the sound is wound up and down in tempo (I’m thinking of ‘Tower of Silence’ here), is an effect I personally very rarely, if ever, hear in dark ambient music. It brings to mind an image of a sinister DJ entertaining the legions of hell. Dakhma is a smooth album, one that can be relaxed to, your mind left to wander, but it’s also an album that rewards the attentive listener with its various layers of sound. 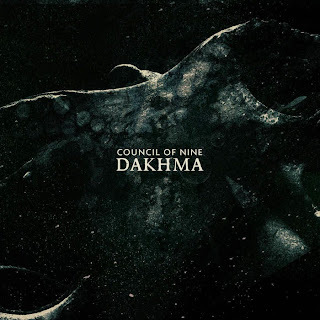 I give Dakhma 4.5/5 and I hope to see more come from Council of Nine as soon as possible. Have a look at the Dakhma page here on Bandcamp to find out more.